What goodies does DuckDuckGo have? 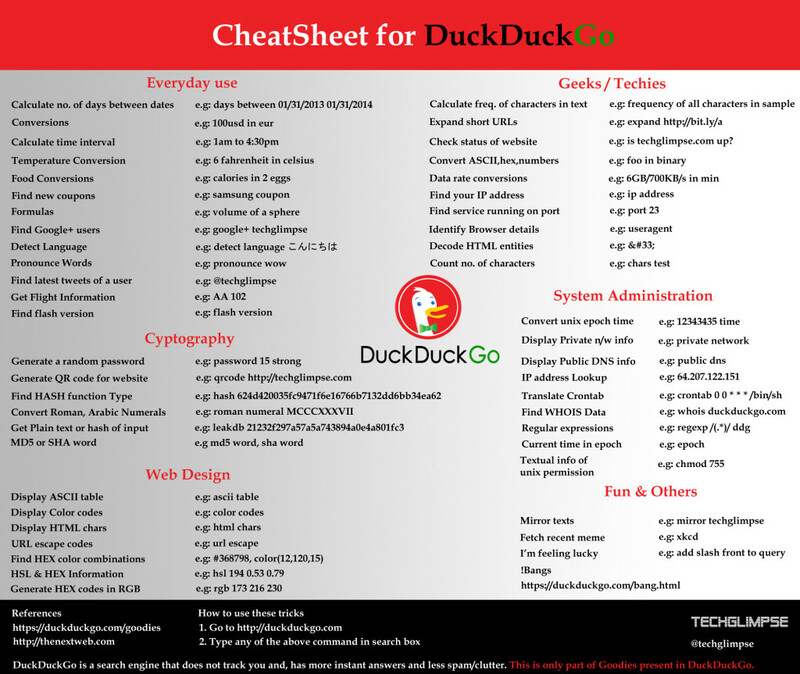 How to embed DuckDuckGo Cheat sheet on your website? Wouldn’t it be handy to have a cheat-sheet for a search engine you use daily? That too for a search engine that has tons of goodness to make life easy and display instant results?! Yes, we too thought the same and here is a smart sheet that can actually help you to get better and desired search results easily and quickly. If you are a regular user of DuckDuckGo, scroll to get the cheat-sheet, for others, here is a quick briefing about the search engine. DuckDuckGo is a search engine just like Google, Yahoo, Bing and so on! But, there is a great difference and the difference is what we treasure – privacy! Even-though, we are already alarmed of the privacy threats around and the big money making that is happening at our data’s cost, our steps to shun them are really not quite enough at this point. So its high time to turn-on and make right decisions to secure ourselves online. And that can start from searching with DuckDuckGo. DuckDuckGo has tons of goodies and shortcuts that you can use for everyday life. Be a gamer, a mathematician, a programmer or a music lover; DuckDuckGo has enough special queries to suffice your thirst and give instant results. For eg. If you are in confusion and want some help to take a decision between this or that – “roll die” could give you a clue! If you want to generate a quick QR code for your website just type – “QR <websitename>” and get the code scanned for use! How easy is it? Here is a more elaborate and intuitive list of goodies available with DuckDuckGo. Enjoy and share it with friends! Just copy the below code and paste it on your website.